Now that his lieutenants, Garr and Baron Geddon, are over and done with, it’s time to take on Ragnaros the Firelord himself. However, there actually is one more servant to get through as Ragnaros is preceded by his most trusted subject, Majordomo Executus. You’ll have to take down both of these fearsome opponents in a single match as Ragnaros will take control of the game immediately after Executus falls. There’s no class challenge for this boss, but the normal and heroic challenges will still put you to the test. For the normal challenge, Executus will start things off with the standard 30 health and a hero power that summons a 1/3 Flamewaker Acolyte for 2 mana. His line-up of minions includes Flame Imp, Flamewaker, Core Rager, Fire Elemental, Magma Rager, Core Hound, and Fireguard Destroyer. Magma Rager is generally considered one of the weakest cards in the game, but you should still be cautious as striking it down with a Druid or Rogue hero power could set you up for his trump card (although you can still get away with it). 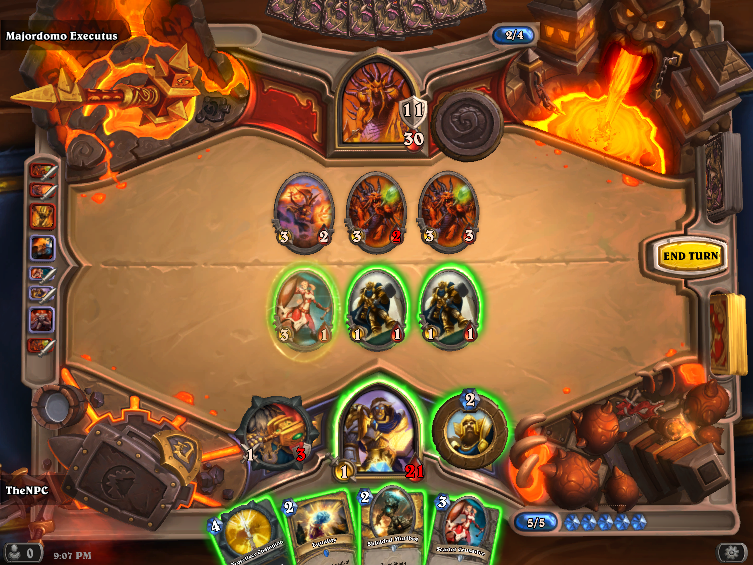 Executus has a whooping seven Molten Giants in his deck. Molten Giant is an 8/8 that costs 20 mana, but its cost goes down by one for each point of damage that the hero playing it has taken. Once Executus goes below 20 health, you’ll need to be on the look-out for these massive brutes. Knock him down to around 10 or less health and he’ll be able to flood the board with giants in a single turn and your odds of surviving from there are slim. With how many copies he’s running, you should always assume that he has at least one or two copies in his hand at any point in the game. You’ll have to be extremely careful in how much damage you deal to him at a time. Get him down to around 15 health, maybe more, and set up your board to finish him off in a single turn. He doesn’t have any taunt minions, but he will control the board with spells like Fireball, Lava Burst, and Lava Shock. Once Executus goes down, Ragnaros will immediately step in to take his place. He uses the same cards, but his health and hero power will change. On normal, he’ll start with only 8 health and 8 armor. If you were able to prevent the giants from coming out, they’ll be useless to him now. His new hero power will deal 8 damage to a random enemy for only 2 mana. If you don’t maintain a strong board presence with plenty of minions, he’ll easily crush you and everything you have. The key to beating both of them is to use a control deck with a focus on late-game punch. Any class will work so long as you design your deck to focus on bringing down their early minions while filling up the board with your own minions that can burst the bosses down. Minions with strong stat lines, damaging spells, and weapons will give you all the tools you need. This battle is mainly a test of your ability to control the board and knowing when to go for the face. Prove your wits and earn the Imp Gang Boss and Majordomo Executus cards for your collection. In the heroic challenge, Executus will start with 30 health and 15 armor and his Flamewaker Acolytes will have a 3/3 stat line. 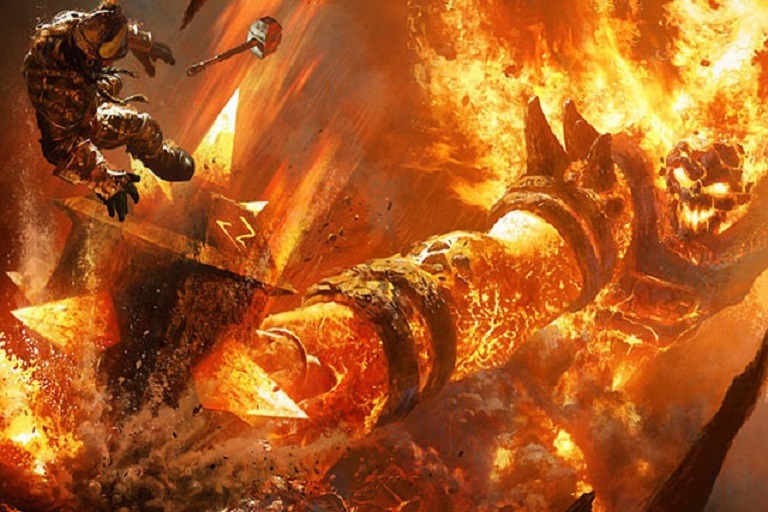 Ragnaros’ hero power will fire two shots of 8 damage and he’ll have 30 health and 30 armor. All told, you’ll need to deal 105 damage to take out both bosses. The deck will be exactly the same, there are just much fiercer powers to play around and there is a lot more damage you’ll have to deal. Board control is still vital in this challenge, but it’s going to take a more tailored deck to challenge. The most reliable class is Paladin as his hero power will help you last against Ragnaros’ power. This deck focused on divine shield takes board presence and minion survival to the extreme and it works. Move to flood the board as quickly as you can while saving Equality and Aldor Peacekeeper for when you can get the most out of them. That does it for the Molten Core wing. Next up is the Blackrock Spire with Highlord Omokk, General Drakkisath, and Rend Blackhand. This is where we’ll really start to see how well dragon decks will do in practice with plenty of new cards to support the concept. Here’s to new challenges and new possibilities in the meta game. Next articleLife Is Strange: Is Chloe Destined To Die?